AFS® (Advanced Farming System) gives farmers the ability to control the entire crop production cycle and has been at the forefront of precision farming for more than a decade. Case IH AFS™ tools include everything you need to achieve repeatable accuracy down to 2.5cm, reduce overlaps and cut input costs — and maximize your yield potential. The AFS™ Pro 700 monitor touchscreen puts key functions at your fingertips. We only use touch screens because we know you demand a no compromise fully portable approach in your operations. This can be factory installed with your new Case IH tractor or combine harvester or or retrofit an AFS™ solution to your existing equipment. Precise down to just 2.5cm with RTK means you can keep your work parallel which will lower fuel costs, reduce inputs of seeds, fertilisers and plant protection products, and reduce time needed to get the job done. Simply select the best level of precision that suits your needs. 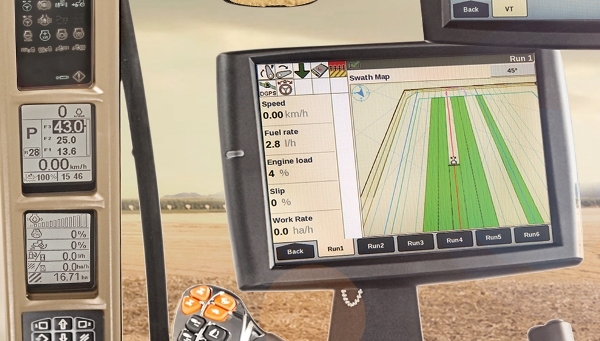 By installing a GNSS (Global Navigation Satellite System) antenna on your machine, this will give access to our Advanced Farming Systems and to steering guidance/auto-steering, telematics, automatic section control, harvest mapping and much more. The AFS™ software lets you view, edit, manage, analyise and utilise all your precision farming data collected from your equipment and other sources. The software also allows you to organise and generate layouts, reports, charts and maps, all with a single software program. And you can control who gets access to what information with AFS™ Connect built-in administrative levels. For more information contact our sales department or visit the AFS™ web page.